This brand-new resource focuses on the common clinical features, diagnosis, and management of the full range of rhythm disorders, highlighting basic science only where necessary. 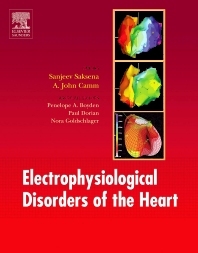 To-the-point and practical, this text discusses everything from cardiac rhythms and arrhythmias...to disease states associated with cardiac arrhythmias...to the latest pharmacologic and interventional therapies. Outlines the common clinical features of rhythm disorders and how to treat and manage them. Features a mini-textbook of mechanisms, identification, analysis, and prognosis for most common arrhythmia types in the section on rhythms and arrhythmias. Provides management strategies for complex patient problems. Discusses hot topics such as genetics and cardiac arrhythmias, Brugada syndrome, and devices for the management of atrial fibrillation.